Motherwell have signed Blackburn Rovers defender Gavin Gunning on loan until the end of the season and have also extended Chris Humphrey's contract. Gunning, a Republic of Ireland under-21 international, has previously had loan spells at Bury, Tranmere and Rotherham. Fir Park manager Stuart McCall has been looking to strengthen his defence since the departure of Mark Reynolds. Winger Humphrey has signed a one-year extension to his deal, taking him up to the summer of 2013. The club say Humphrey was the subject of interest from north and south of the border and are "delighted" to have tied the former Shrewsbury player down for an extended period. McCall is pleased to have bolstered his squad with the capture of Gunning and told the Motherwell website: "We have some really talented youngsters coming through on the left flank but they are not quite ready as yet. 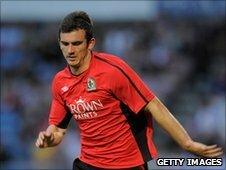 "Gavin is someone who is highly rated at Blackburn and, importantly, someone who has experience of being out on loan before. "Sometimes young lads can get overawed going out for the first time but given he's been at Tranmere, Rotherham and Bury means he'll have experienced different styles of football at different clubs." Humphrey arrived at Fir Park in 2009 and was given time off early in his Motherwell career after he and his partner lost their unborn baby. "When the club approached me and asked if I would sign an extension to my contract it was an immediate answer," said Humphrey, who later became a father. "When my family and I were going through a very difficult time the club and the fans offered us amazing support. "We are very much settled here and I could not be happier than to agree to extend my contract with a club that offers the support that we received when we needed it. "I just hope I can perform to the best of my ability and repay the faith shown in me by both the club and the fans."